When the season changes so do your outfits and the must-have trends. For the fall, you will want to pick warmer pieces that use the color and the prints of the new season. To give you some inspiration for your fall wardrobe we have found 21 of the best fall outfits we’re dying to try. We have classic plaid, cute skirts, sweaters, accessories and more. 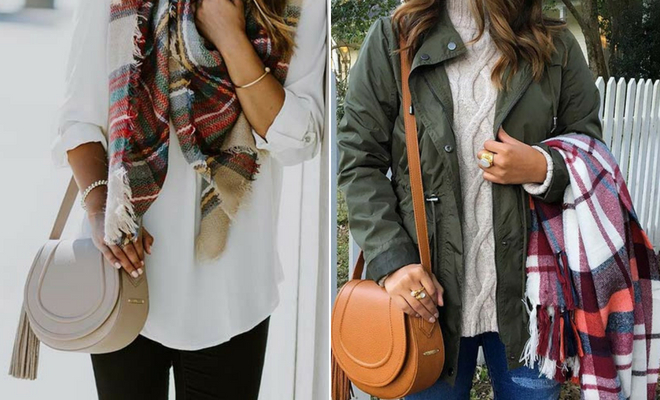 We hope these fall outfits inspire you. The first outfit we want to show you is this chic plaid coat and jeans. 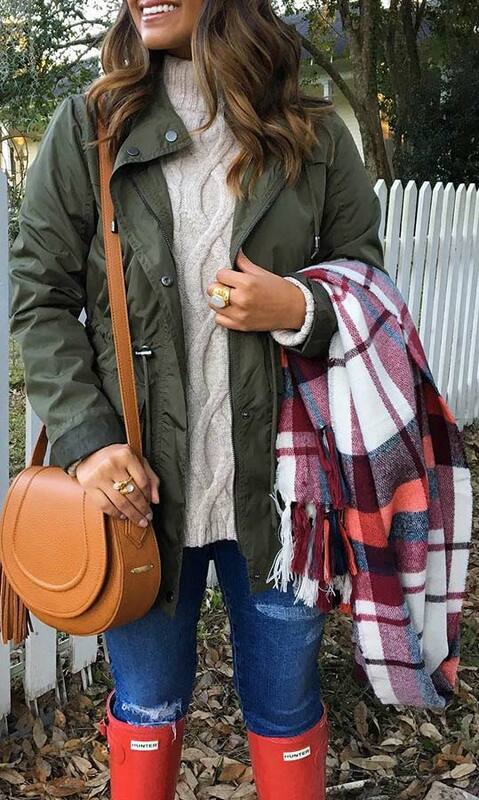 Plaid is a must-have for the fall so a coat with the pattern would be perfect. You can wear with jeans and heels like featured or maybe with jeans and sneakers for a relaxed look. If you were going on a night out, or if you needed to glam up a bit, maybe wear the coat with a dress or a skirt. When the fall season arrives the temperatures will cool down so, you should have a cozy cardigan in your closet. Our next idea shows how to wear a cardigan in style. The look features a fluffy cardigan with a white top and black ripped jeans. We love this outfit because it is warm but trendy. With a cardigan like this you can dress it up or down and wear with any jeans or skirt. Next, we have a cute outfit that is comfortable and easy to wear. The outfit features a long, plaid shirt dress with long boots. It is effortlessly stylish and you can have a few long shirts like this so you can mix up the look. An outfit like this will suit any boots. Our next idea features a neutral outfit and vibrant, tartan scarf. The outfit has a color palette of black, white and other light colors which is a super stylish combination. It also has a pop of color with the tartan scarf. An outfit like this is great to have in the closet because you can wear it all together and wear as separates with other clothing too. You will wear pieces like these over and over again. The fall season usually brings rainy showers with it. So, rain boots are a must-have. You can wear very stylish rain boots but don’t just take our word for it, check out this next outfit. The look features a cozy sweater, jacket, jeans and red rain boots. We love the red boots because they add a flash of color to the outfit. You can wear boots like this with any outfit too. If you want a relaxed, casual and stylish outfit idea then our next pick is for you. 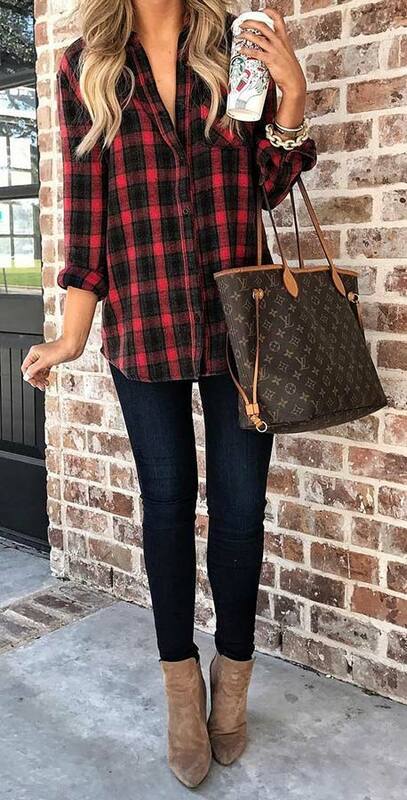 The look features a plaid shirt with jeans and cute boots. This is a gorgeous outfit that will suit anyone. You can choose a red plaid shirt like featured or choose another color. If the boots are not for you, then you can try sneakers too. Next, we have a very trendy fall outfit idea. The outfit is made up of a choker style sweater, jeans, stylish boots and a gorgeous jacket. A jacket like this is perfect for the fall because of the color. This is another outfit where these pieces look great together and as separates with other things too. We love plaid for the fall. Our next outfit shows another way to wear. Here we have an outfit with a cute plaid skirt, long boots and a pretty top. This is a super stylish outfit idea and it can be worn for any occasion as it can be dressed up or down. There are other color plaid skirts available too. You can jazz up the simplest of outfits with accessories. This outfit is made up of a casual top and jeans. It is finished off with a stylish scarf and a chic hat. The hat and scarf is perfect for the cooler season and it makes a plain outfit look very trendy. You can use any color hat and scarf and wear with any outfit. Next, we have a cute and cozy outfit idea. The look features a sweater, jeans and a plaid wrap. To recreate this outfit you can use a cape, poncho or even an oversized scarf. With a scarf, you can wear it like this and around your neck too. You can get wraps like this in all different colors and prints too.